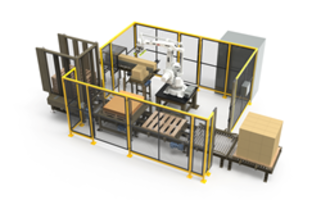 The Brenton’s RPX Series Configurable Robotic Palletizing Cells are available in four configurations in sizes ranging from 11.5 x 17.5 ft to 15.5 x 22.5 ft. The units automate palletizing of cases, trays, bags and pails and are designed to meet Category 3 safety standards. They can be easily disassembled, moved, and reassembled. The cells are offered in one line in/one line out, two lines in/two lines out and one line in/one line out and two lines in/two lines out with automated pallet handling. ALEXANDRIA, MINN. (PRWEB) OCTOBER 08, 2018 - Brenton, a product brand of ProMach, introduces at Pack Expo 2018, October 14-17, McCormick Place, Chicago, the new and innovative RPX Series of configurable robotic palletizing cells. The RPX Series gives small- to medium-sized food and manufacturing companies the opportunity to quickly, easily, and cost effectively advance from manual to automated palletizing of cases, trays, bags, pails, and other packaging. The RPX Series reduces the number of employees on the packaging line and lowers the risk of repetitive motion injuries within the plant. There are four unique RPX Series cell configurations available: one line in/one line out; two lines in/two lines out; one line in/one line out with automated pallet handling; and two lines in/two lines out with automated pallet handling. These cells feature compact footprints, ranging from the smallest 11.5 x 17.5 feet up to the largest 15.5 x 22.5 feet. RPX Series palletizers are rated at up to 14 cases per minute. RPX Series cells are delivered to the customer with two pack patterns already installed. New pack patterns are easily entered via touchscreen display, giving food companies and manufacturers the flexibility to easily and quickly adapt to new orders and customer requirements. RPX Series cells can be delivered in as little as 14 weeks, about half the time of custom systems, with end-of-arm tooling to meet the demands of today and the changing requirements of tomorrow. Brenton engineers designed a quick connect modular platform to install cells in just hours. These modular cells are easily disassembled, moved, and reassembled as plant conditions change. The RPX series was also designed to ensure the safety of its operators, meeting Category 3 safety standards, as well as designed to sustain a long and productive life. “Brenton recognized that many small- to medium-sized plants do not require custom solutions, but instead will benefit from affordable, configurable, and reliable modular systems that can be delivered quickly,” said Jason Enninga, Vice President of Sales, Brenton. See a RPX Series cell at Pack Expo 2018, Brenton Booth # S-3644. Brenton engineers and manufactures custom case packaging, palletizing, robotic packaging systems, including material handling, high speed pick and place, and integrated end-of-line systems. Specializing in food, beverage, pharmaceutical, medical device, personal care, and household products, Brenton surpasses regulatory and market driven demands and creates collaborative, long-standing partnerships to best serve a diverse customer base. Brenton is a product brand of ProMach, a global leader in packaging line solutions. As part of the ProMach End of Line business line, Brenton helps packaging customers protect and grow the reputation and trust of their consumers. ProMach is performance, and the proof is in every package. Learn more about Brenton at http://www.BrentonEngineering.com. Stainless Steel Palletizer withstands harsh environments.